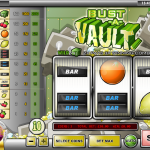 Bust-A-Vault is a 3 reels slot game released in 2008 by Rival. You really have to like 3 reels to appreciate it but with the good games in the genre you always feel you’re a spin away from winning the jackpot. The Wild in this game is the Vault symbol. It is also the jackpot symbol and will pay you 2000x of your bet when you land 3 of it. Your wins will also come with a 2x or 3x multiplier when you land 2 or 3 symbols respectively. You can also win with 3 different fruit symbols or 3 different coloured bars. 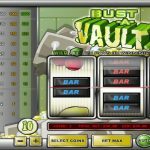 Bust-A-Vault is a simple slot game. there isn’t any strategy worth remembering but it doesn’t mean that the game is not fun. In fact it can be very engaging if you’re a fan like us of 3 reels slot games. 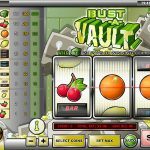 If you’re a fan of classic 3 reel slot games then you should consider playing Big Cash Win a 3 reel slot by Rival.